The entrance to E-Z Boat Storage requires a gate code for access to the complex during non-operational hours. Additionally, we monitor our shoreline and boat launches with a roving camera to capture activity from the water. Your boat and or auto are locked inside by Master locks. Let us hear from you! We need your input to know how best to serve our customers. 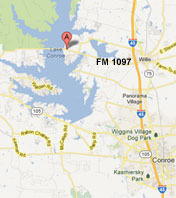 Let us know how your experience at E-Z Boat Storage and Lake Conroe has been. We just wanted to take a moment to say a big Thank You for the Exceptional Service for 2016. You and your Team (sorry we cannot name everyone) make our boating experience such a pleasure. We have been tenants for just a year but the level of service you guys provide make it seem like a lifetime. We are at complete ease knowing you guys are taking care of our boats. We wish You and You Team a very Happy Holiday and Happy New Year. Please find forthcoming $100 to spread among yourself and your Team. We have been tenants since 2/2016 with our 24’ Cabin Cruiser and since 5/2016 with our 17’ Jet Boat. If you have to store your boat this is the way to go – “Valet Launch there is no substitute” The rental price is comparable and the units are clean, well maintained and all have concrete drives. There are multiple wide and deep boat launches and multiple tractors so basically no or very little wait time. All of the staff like Baylee have a Fantastic Attitude, Exceptional Customer Service and Great Driving Skills and trust them completely with moving our baby in and out of the stall and lake as they all do it like pros. We recommend E-Z Boat Storage to anyone who wants a Fantastic, Clean, and Easy Access Dry Service Facility on the main body of the lake. My total boating / fishing experience is always better because of the excellent courteous assistance from the valets and tractors that handle launching tasks. Your facility is second to none and I have happily recommended your services to several other boaters. E-Z Aerial- The Palms Marina and E-Z Boat Storage are state-of-the art boating complexes with dry and wet storage for amost any size boat. These are both ‘park and launch’ valet style operations. The Palms Marina also provides more than 150 recently built wet slips in their deep water basin.